As of January 1, 2013 the NCBTMB credential of “National Certification” was retired and the “Board Certification” credential was introduced. Taking some NCBTMB-certified massage therapists by surprise, these changes have caused a lot of confusion. Find out the answers to some commonly asked questions. Those who have held the credential of National Certification through the National Certification Board for Therapeutic Massage & Bodywork (NCBTMB) who are looking to renew their certification this year have been speaking out about their confusion over the new Board Certification credential. Here at the Institute for Integrative Healthcare Studies we have worked with the NCBTMB to get answers and hope to alleviate some of the common questions that are stumping NCBTMB members. Renew early, prior to January 1, 2013, and maintain your current credential – National Certification. This would allow you to continue with the National Certification credential for another four years. When your four years are up, you can only renew to the Board Certification credential if you meet the requirements. Don’t renew early and wait until your renewal is due. When you are due to renew your National Certification you would, instead, renew under the Board Certification credential if you meet the requirements. For therapists who did not renew their National Certification prior to January 1, 2013, you can only now renew as Board Certified. But, Board Certification comes with additional caveats in order to be in compliance with the standards. The Board Certification Exam – Does Everyone Need to Take It? What If I Don’t Meet the Board Certification Requirements? Since many states with licensure legislation require a minimum of 500 hours of training to sit for a licensing exam, there are quite a number of therapists who currently hold National Certification but do not have the 750 hours of total education required for the new Board Certification. Therefore, many massage therapists are wondering what will happen to their National Certification when it comes due for renewal. The answer is quite simple – either you obtain the additional hours you need through continuing education to obtain the 750 hours of education – or you will no longer have a credential through the NCBTMB. There are some massage therapists who wish to obtain the Board Certification credential, but are a few educational hours shy of doing so. When we spoke with our contact at the NCBTMB we were told that these therapists should contact the NCBTMB directly to discuss their options. It appears that the NCBTMB will work with you on the best course of action to obtain those few remaining hours. On the other hand, if a massage therapist needs many hours in order to meet the 750 hour standard, they must begin courses right away so they can complete this supplemental education before it’s time to renew to Board Certification. Why Did the NCBTMB Change the Credentials and Requirements? Should I Become Board Certified? This is a question that many in the profession will debate. Some states may require that you maintain a credential with the NCBTMB along with your state license. Some employers might insist that you obtain and maintain Board Certification. Keep in mind that Board Certification for massage therapy, similar to other healthcare fields, demonstrates to others that a specific level of training/competency has been met. 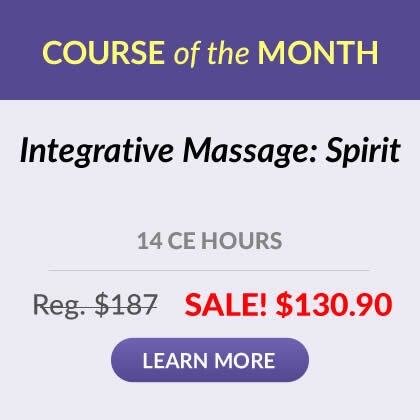 With the Board Certification credential you are setting yourself apart from your colleagues as having met a more stringent standard in the field of massage therapy. You cannot take more than 4 hours in courses less than 2 credits. UPDATE! This restriction has been eliminated as of October 2013. UPDATE! The NCBTMB reinstated the ethics requirement. 3 CE hours out of the 24 must be in ethics. * To be clear, this research education is NOT required to become Board Certified. The research requirement is only for those who are already Board Certified and will need to renew their Board Certification every two years. We hope that this information has helped to eliminate some of the confusion surrounding the credential changes at the NCBTMB. If you have any questions regarding the Board Certification requirements or your renewal, please add a comment below this article, call the Institute at 800-364-5722 or send us an email through our contact form. If you need additional hours to meet the 750-hour educational requirement you can take any of the Institute’s courses to fulfill this requirement. 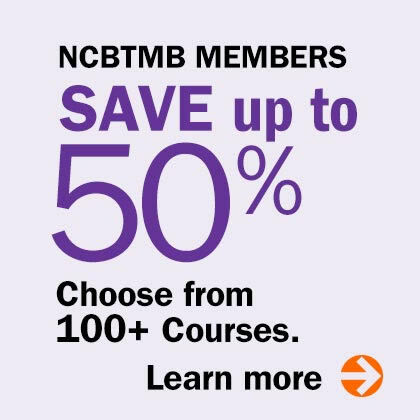 Plus, we have created brand new special savings for NCBTMB members. Take a look at the Institute’s NCBTMB Board Certification Savings. If you need CE hours for your Board Certification renewal, our courses can also satisfy these requirements. Simply visit our NCBTMB page to review the requirements and browse our home study course offerings. For assistance with questions pertaining to your specific recertification needs we recommend contacting the NCBTMB directly at 800-296-0664 or by email at info@ncbtmb.org. If you have a Facebook account you might also consider contacting the NCBTMB through their Facebook page at https://www.facebook.com/NCBTMB.